Free Interoffice Trunking has various solutions, but the one based on Skype is the best solution because of its reliability, easiness, simplicity, security and crystal voice quality. Company will not afford any other budgets or investment after one time payment. Yeastar provides the optimum solution of Skype Interoffice Trunking. Reliability: Skype is the largest VoIP provider in the world and the most reliable service is accessible from Skype. 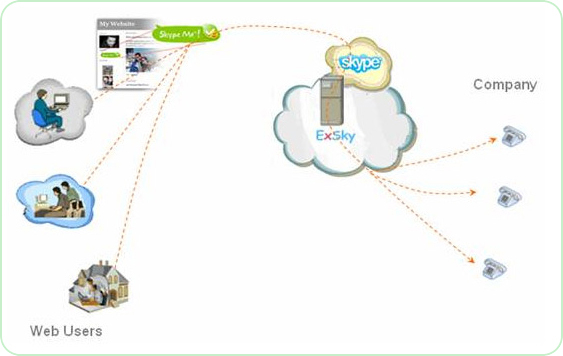 Easiness: Take uses of Skype services to connect by point to point and no need to build up Internet server. Security: Place the communication server behind router to against attack Voice Quality: Skype uses P2P technique and it is generally accepted that Skype is the best VoIP software. This Interoffice Connection solution is based on free Skype2Skype calls. Enterprises with offices in multiple locations or even in different countries can enjoy the long-distance calls freely by installing a Skype gateway at each site. Callers can use their existing TDM-based telephone system or IP based systems to call other sites within their enterprise without incurring long distance phone charges or managed network charges. Free calling among offices through Skype-to-Skype trunks in stead of costly point-to-point lines. Skype incoming calls are transferable to an idle Skype trunk automatically. Requires no public IP address or complex router/firewall configuration. Reach the other site directly and easily on Direct-line. Compatible with any PBX or IP PBX system to meet different system requirements in different offices.